However, without some risk there is often no reward, so the question turns to finding the club that is right ‘fit’ for the player. This needn’t be a laborious process. 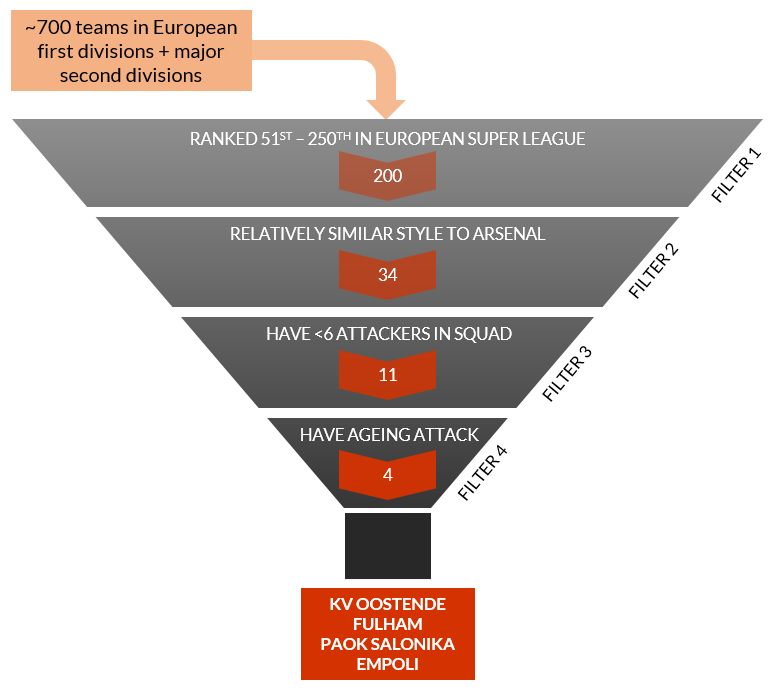 A simple filter, as illustrated below for an Arsenal striker like Chuba Akpom, can highlight a couple of potential destination clubs that can be approached in the first instance. This is a process that can manage the risk, and give ourselves the best chance of making the experience valuable in the player’s development. The filters could of course be altered or removed – perhaps we would want to identify teams that play two up front to give a better chance of playing time, and often there are further geographical and cultural issues to consider. What’s more, the filter can produce an outcome that can be mutually beneficial for both clubs, in highlighting squads with potential needs in personnel. While opportunism around loan deals can occasionally strike gold, a strategic process can partially de-risk a potentially key phase in a player’s development.